Beach-lovers and surf hounds have long favoured the wild beauty of Costa Rica for their annual dose of sun and sea. The arrival of the bijou, adults-only Mint Santa Teresa hotel is just the excuse we need to block out some dates for our summer retreat. Terraced into the side of a steep hill with sparkling views of the Pacific Ocean, the four-bedroom property is the work of Benjamin Garcia Saxe, his Costa Rica office ably creating a series of interlocking all-white pavilions that seamlessly blend Greek architectural influences and Scandi-minimalism with locally-sourced materials such as caña brava grass and carved timber furniture. 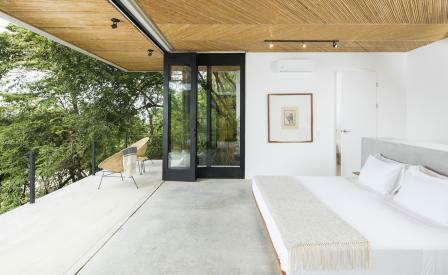 Each room features a rooftop terrace – the sun held at bay by a sail-shade – which is furnished with rattan furniture made in Sarchí, a Costa Rican town noted for its craftsmanship. From every vantage point, the eye is drawn towards the distant horizon though the architects have thoughtfully framed the whole against both manicured landscaping and the wilder hillside tropical foliage. The communal lounge area and infinity pool make for great social mixers, though the diversions are equally tempting, including nature trails on horseback, exploring Montezuma, and kayaking to nearby Cabo Blanco for the sunrise.